Momentum halted: ECU came into the series playing absolutely great baseball. The Pirates had won 17 of their last 19 games. ECU was 21-3 on weekend games going in, yet to lose a weekend series. That all came crashing against UCLA who promptly swept ECU 3-0. Chances: ECU had its chances to actually win two out of three with the top-ranked team. The Pirates held a three-run lead in the sixth inning of the series opener on Friday before UCLA’s bullpen shut them down the rest of the way and Michael Toglia single-handedly defeated the Pirates with five runs driven in. Speaking of Toglia, he also was guilty for ECU not pulling out the other close opportunity to win. The first game of Saturday’s doubleheader was tied 5-5 in the ninth inning when Toglia blasted a three-run walk-off home run to win the game. A small break here or there and ECU could be moving up very high in the standings this week. 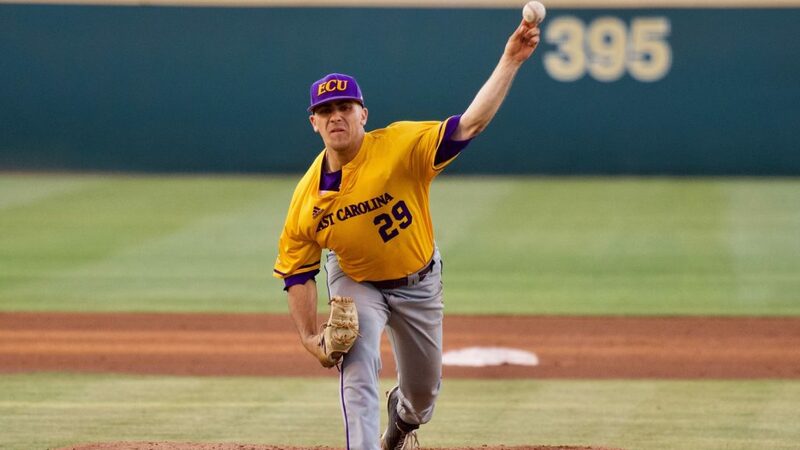 Not a good test: This series was a great chance to see how ECU could stack up against a team that’ll surely be hosting a regional and has a great chance of heading to Omaha for the College World Series, something ECU wants to accomplish as well. ECU had already played two top-10 teams earlier in the season, losing against Mississippi State (8) and defeating Ole Miss (9). ECU also lost to Duke when the Blue Devils were ranked No. 24 at the time. So with the UCLA sweep, ECU is 1-5 against ranked opponents this season. UCLA is the top-ranked team in the country and very good, but the Pirates will have to run through a team as talented as UCLA at some point to reach its ultimate goal. Almost home: Another thing to say is that ECU did travel to Los Angeles to play UCLA at their home field. The Pirates are almost done with a stretch where they played 14 out of 18 games on the road. They have another one on Tuesday against Elon and that’ll make it 15 of 19. Thankfully, the Pirates are back in Clark-LeClair for seven of the next eight games after Tuesday. ECU is 15-3 at home this season and 10-7 on the road. No stream in 2019? : What was kind of a popular topic going into the weekend got even more interesting. UCLA did not find a way to stream the series between the two top-10 teams. Yet John Packard, father of ECU outfielder Bryant Packard, came through for everyone when he live-streamed the games on Facebook. Packard had hundreds of people tune into his stream of the game and gave kudos for his handling of some rowdy Bruins fans. Also, kudos to Packard for being able to hold his phone for the entire game so that Pirate fans, Bryant’s mother Cherry, in particular, could see the game.